Acorns is a financial app that helps clients build up their savings via micro-investing. The company aims to look after client’s best interests and feels that micro-investing empowers clients, helping them stay on the right financial track. Acorns launched on Aug. 26, 2014. Walter and Jeff Cruttenden founded the company to help give everyone access to investing. The company is backed by world-class board members, advisors, and investors, including some major companies and noteworthy individuals. Acorns aims to stand out from the crowded app market in several ways. One of the most important differences is that everything is automatic. You can set up Acorns to make automatic investments daily, weekly, and/or monthly depending on your preferences. You can also use Round-Ups to make every single purchase of yours an investment. If your portfolio moves along with the market, then Acorns will automatically rebalance it so that it remains on track. Additionally, Acorns is designed to be incredibly simple. There is no minimum and no trade fee to worry about. Instead, you just invest $1, $2, or $3 each month until you reach $1 million in your investments. Acorns’ great support team with advisors on hand help clients deal with everything, including navigating the confusing world of investing. Acorns is designed for residents of the USA, for UK residents we recommend you look at MoneyBox which operates in a similar way. How Do You Invest with Acorns? 1 How Do You Invest with Acorns? 2 What Else Should You Know about Acorns Later? 3 What Is Acorns Spend? 4 What Is Acorns Found Money? 5 What Type of Portfolios Does Acorns Offer? 8 What Devices Does Acorns Support? 11 Who Should Consider Acorns? There are two main methods of investing with Acorns, Acorns Core and Acorns Later. Acorns Core is a micro-investing account which lets you invest spare change and is the only one of its type. You can set up this account in less than five minutes. Then automatically add money to the diversified portfolio that Acorns created for you with assistance from a Nobel laureate. So far, people have invested more than $1 billion in this way. The other option is Acorns Later, which is designed to let you save for retirement. This involves getting a recommendation for an IRA from Acorns. The platform will also regularly update your IRA so that it matches your goals. Signing up for this type of investment account takes less than a minute. So far, there are more than 250,000 investors in Acorns Later. What Else Should You Know about Acorns Later? Acorns Later is designed to be simple. You set it up in a few simple taps, and the program recommends a portfolio and IRA that meets your needs. The portfolio suggestion depends on your current age and how long it is until you get to “retirement age.” The calculation changes naturally over time, so Acorns Later will automatically rebalance investments for you. It is also possible to change your IRA type if you wish by contacting the support team. You can set up automatic recurring contributions, so do not worry about remembering to help your Acorns Later account grow. You only pay $2 per month and get all the great features. In addition, you can invest almost as little as you want at a time, starting at just $5 at once. This makes investing in your Acorns Later more accessible than doing so in other similar accounts, which have higher minimum transactions. Similarly, you only need $5 to open an Acorns Later account, so anyone can easily open this type of account. If you have an IRA or 401(k), you can roll that plan over to Acorns Later to benefit from Acorns’ advantages like low fees. This will also help you to consolidate accounts. For those who need a refresher, IRAs are Individual Retirement Accounts. These IRAs help save up for retirement and do so with tax advantages. The name Acorns Later comes from the fact that retirement is no longer the same as it used to be. Today, many people feel that they may not be able to retire. Others do not feel a need to do so at all since they like the work they do. “Acorns Later” refers to the fact that you can use this account later on in life in an advantageous-for-your-taxes way. You can choose to set up recurring contributions to your Acorns Later account, either daily, weekly, or monthly. Or you can make a one-time contribution via the “Have some extra cash?” card on the Acorns Later home screen. Acorns Later is an IRA, therefore, there will be tax implications if you transfer or withdraw money from this account early. There are some cases when the IRS will waive tax penalties associated with early IRA withdrawals. Acorns recommends you talk to a tax specialist before withdrawing from your Acorns Later account. If you wish to do so, this is possible via the “Withdrawal” option in the application. Acorns Spend acts like a checking account but with some additional features that are unique and help it stand out. This is a comparatively new addition to the offerings from Acorns. The first 100,000 debit cards for Acorns Spend sold out in less than four days. The cards are made from tungsten, which is among the heaviest and rarest non-radioactive elements. They are engraved with your signature, which means there is a limited supply of the cards. Right now, you can pre-order an Acorns debit card. You can use Acorns Spend to automatically save by rounding up purchases. You can also take advantage of custom Spend Strategies, which are simple and smart ways to save as you spend. The process is designed to be easy and includes unlimited free or fee-reimbursed ATMs nationwide, digital direct deposits, free bank-to-bank transfers, and mobile check deposits and sending. It works with Found Money in addition to as much as 10 percent from the local places you visit. For just $3 a month, you get Acorns Spend along with Acorns Core and Acorns Later, no minimum balance fee, no overdraft fee, and the free or fee-reimbursed ATMs. The card is fully protected as well with an all-digital lock and to $250,000 in FDIC insurance. What Is Acorns Found Money? Acorns Found Money is a unique feature where brands invest in you. When you shop with a Found Money partner, that partner will automatically invest money in your Acorns Core account. This is a modern variation on cash back that helps you increase your investments. Just some of the most popular Found Money partners include Airbnb, Barnes & Noble, Billshark, Blue Apron, Boxed, DirecTV, Dollar Shave Club, Earnest, Expedia, Groupon, Liberty Mutual Insurance, LifeLock, Lyft, Macy’s, MeUndies, Nike, Sephora, Stitch Fix, Walmart, and Warby Parker. Acorns is adding even more brands in the upcoming months, but there are already more than 200 partners. To use Found Money, you just have to link a card to your Acorns Core account. This can be a debit or credit card and it only takes a minute to do. Then, the Found Money will occur automatically. It appears in your account within 60 to 120 days of your purchase. At any point, you can view your Found Money status on the history screen of the application. Or visit the Found Money page to see details on the amount you earn from each brand when shopping there. To make Found Money even more useful, Acorns has a Chrome Extension for it that you can download for convenience. This extension is free, but you do need an Acorns Core account. If you do not have an Acorns Core account yet, you can make one in minutes. What Type of Portfolios Does Acorns Offer? Acorns lets clients choose the portfolio that best fits their desires based on the level of risk they want. Each of the portfolios that are offered by Acorns was developed by professionals. Dr. Harry Markowitz, an economist and recipient of the Noble Prize, assisted in their development. Additionally, all Acorns portfolios were structured using ETFs from investment management companies that are well-known, such as Vanguard and Black Rock. Remember that Acorns builds your portfolio for you. If you want a higher level of control over your portfolio, this may not be the best option for you. If, however, you want to sit back and let the professionals create your portfolio, then Acorns is a good choice. There are three account types with Acorns, all of which have low pricing that is straightforward and predictable. The platform only costs $1, $2, or $3 per month until you have invested $1 million. Acorns’ goal is to appeal to everyone, mostly focusing on the up-and-coming, which is why the pricing is so affordable. The Acorns Core program at the $1 per month price is free for college students to get them on the right track. If you have $1 million to invest, Acorns encourages you to contact them directly. The base plan is just $1 per month and includes Acorns Core, the original micro-investing application. This includes automated investing, such as recurring investments, rounding up purchases to invest the difference, and growing due to reinvested dividends. It also has the smart portfolios built with help from the Nobel Prize economist mentioned above. Acorns Core includes access to Grow Magazine for money advice and Found Money, which is over 200 top brands that invest in you whenever you shop. You will also have access to the customer support team. For $2 a month, you get Acorns Core as well as Acorns Later. This adds in features such as the ability to set up the Acorns Later account in less than three minutes, and a personally-recommended IRA and portfolio. You will also get automatic updates to your investments as you get closer to retirement, the ability to set automatic recurring contributions, and assisted rollovers. It also includes Anytime, Anywhere, which is the ability to set aside any amount of cash for the future. Finally, $3 a month includes all of the above as well as Acorns Spend. The last of which is a checking account that does more. It lets you instantly save and invest with automatic retirement savings, custom spend strategies, real-time roundups, and more. It is easy with great access. You will get features like free bank-to-bank transfers, digital direct deposits, mobile check sending and check deposit, and unlimited fee-reimbursed or free ATMs around the country. Acorns Spend also increases your earnings with as much as 10 percent invested in you from the regular places you visit. There is no minimum balance fee nor any overdraft fee. This plan also gives you tools, such as original content and quick tips, to help you grow your money-related knowledge. This $3 plan is also fully protected. There is FDIC protection up to $250,000 as well as an all-digital card lock, 256-bit data encryption, and fraud protection. Acorns is a great option for money, but be conscious that the low set fees are both good and bad. While $1, $2, or $3 is a small amount, it can be a large percent of your balance, if you do not have a lot invested. Since you only need to invest $5 a time, a $1 fee would be a big chunk of this. The good news, however, is that as your account balance increases, the fees drop in proportion to your earnings. Acorns features everything people not currently saving need to start, but they should know that fees for low-balance accounts are a bit high. What Devices Does Acorns Support? Acorns is designed to be used on mobile applications, although you can also log in via the Acorns website. The application is available for both Android and Apple devices. Acorns’ customer support team has more than 150 people and is in Irvine, Portland, and New York. You can find a link to Acorns Support page at the bottom of any page of the website. This Support page has a detailed FAQ section that you can browse by categories or search to get answers. You can contact Acorns Support in the top right corner of any page. Just click on “Contact Us.” This will take you to a contact form that is then sent via email. You can find plenty of educational information from Acorns in the “Grow” section, where you grow your knowledge. You will find a vast range of articles on all types of financial topics. “Grow” is a separate but connected page from the Acorns main page. It has major categories at the top of the screen for Money 101, News, How-Tos, and Interviews. You can search for a topic or article or sign up for the Acorns Grow newsletter. On the main page of Acorns Grow, there are several categories of articles: Most Popular, Millionaire Money Tips, Voices, and Interviews. Acorns is a great choice for college students who want to start saving since it is free while in college. You only need $5 to start investing which means anyone with a limited budget but future financial goals can benefit from Acorns. It is also a good option for those who struggle with saving in traditional ways or those who prefer a more hands-off approach. Acorns appeals to those in search of a hands-off approach because it lets you do as much automatically as you want. You can set up automatic roundups when you make purchases to save as you spend and set up automatic recurring contributions. There is also automatic rebalancing and the fact that Acorns guides you through selecting a portfolio (and IRA in the case of Acorns Later) appeals to those with minimal investing experience. Acorns is a great way for people to start saving money for any purpose, whether it is retirement or a sooner goal. Acorns Core allows for simple savings for any goal while Acorns Later is an IRA specifically designed for retirement. 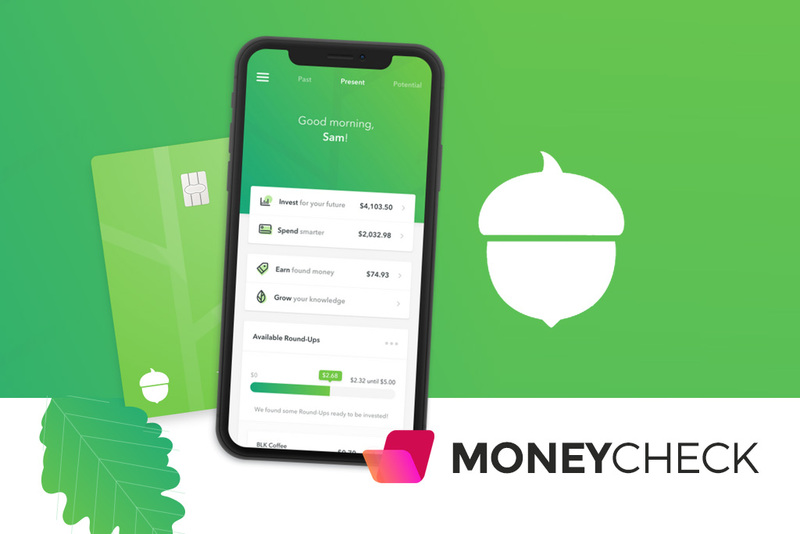 The company also offers Acorns Spend—a checking account with some unique benefits, including no ATM fees and money back via Found Money. Acorns is very affordable, and the Acorns Core account is free for college students, which makes it ideal for them. Overall, we recommend you take a look at what Acorns have to offer, it’s a great first way to get started saving some money and the app also has numerous other features.